Wow, I have been trying all morning to get here to post. I don't know if it is my computer or Blogger, but it is frustrating. I have been trying to leave comments and it won't let me do that either. I told you I have a lot of pictures to post so here are some of a recent project. My LAQ, Liz, used her embroidery machine to create these wonderful animals. then she gave them to me and asked me to make them into a quilt for the U of M raffle. I designed a quilt with my trusty graph paper, cut out all the blocks, and sewed all the blocks. Then I layed it out. I HATED it! I used the thirty's reproduction fabrics, which look good with it but it was too busy. So I cut out some more blocks and now they are sitting on the cutting table (under Jack, most of the time, LOL) I had done a 4 patch alternating with a pinwheel. I like the design, but the 4 patches were too much when done in 4 different colours. So I will make them using 2 white squares and 2 of the same colour 30's fabrics (hope that makes sense). That is how the pinwheels are done, one colour and white. I think it will calm it all down and you will "see" the animals more. I will post it as I get more done. I did get the binding done on the 2nd bear quilt and also on the Winnie the Pooh quilt. I took photos of the WTP this morning so I may try to post those later this week. I feel completely AWFUL right now and am considering going home. I went to bed with a scratchy throat and I think I had a fever. I woke up with soooo much more, laugh. Headache, scratchy throat, body aches, fever and nausea. I feel a little better right now and am going to try to eat a little bit, but I am not really hungry. I have quilting tonight with the church ladies (CL, for you Char!) so I want to go home and rest. I don't know if I mentioned it or not but I joined Weight Watchers last week. So tired of being overweight! I weigh in today, so keep your fingers crossed for me!! I have so much more to write about and lots of pictures to share but so little time so I will run right now and post again tomorrow! I am soooo excited. The Meechigan quilt is on the acution site and open for bids as of 8am this morning and guess what????? You can register and bid on any of the items that are posted there and you can see my quilt (#92). My friend, Ellen did an artsy wall hanging and it is #91. Let me know what you think of the art work. My friend, Robin, and I made the first one together. I cut it all out and made off the "M" applique's and handed it off to her. She sewed the center of the quilt together. Then, she gave it back to me to make the borders. We than handed it off to our friend, Liz, to work her magic (I mean quilt) it. When she brought it back to us, it was so beautiful, we thought maybe it should go for raffle rather than auction. Maybe it would raise more money that way?? Well, I had made 4 "extra M's". What to do?? Why, make another quilt of course!! Smaller, and use it for the acution. What??? The deadline is when??? The deadline was one week from the decision to make another quilt!!!!! Needless to say, I busted my hump and got busy. I had it done from cutting to finished top in about 4 hours. I gave it to Liz on Monday, got it back on Wed and had the binding done and on in time to turn it in on Friday. WHEWWWW!!! You can see the whole "Lap" size one here. I haven't got photos of the "BIG" one yet!! You can see the magic of Liz's wonderful quilting from the back on the "M's"
She went around each star too. Liz quilted "U of M" into every rail fence block too. I just posted the plain one as it is difficult to see it in the focus fabric one. Liz also quilted "M go blue" into the outer borders, but I haven't been able to figure out how to photograph it to make it show up. If I take the photo from the back the words are backwards, and it is difficult to see on the crazy M fabric on the front. I may take it from the back and flip it on the computer, we'll see. This is the website for the auction. http://141.214.4.32/auction/ Anyone can bid, it works like ebay. All money raised goes to the patient's charity here at U of M. Look for the quilt raffle on the pathology website coming soon too. I should be putting photos in of our Mackinac trip but instead I am putting in pictures of the latest quilt! 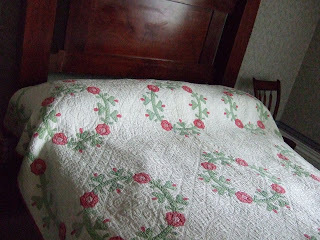 I wrote about this bear fabric and posted a photo now the quilt is done! I used mice squares in the center of every 9 patch, and my friend Liz, quilted mice into it. You can see on the close up and on the back, especially, how cute those mice are! This is the label. I work at the U of Michigan doing biomedical research. I have to manage many mice and we have a very large breeding colony (19 different knock out strains of mice!). The wonderful woman that actually keeps track of all the breeding and pups and helps me ALOT, is kimberly. Not only is she a co-worker, she is a friend. She and her husband have decided to adopt another child, they have 2 children already, one 11 and one is 14. The newest addition is Sean and he is 2years old. They go to court for the adoption finalization on the 12th of this month. I thought this quilt was perfect for both a beary special little boy and my friend who manages my mouse breeding colony! This is Kimberly after she opened the quilt this morning. I hope Sean likes it as much as she did! Welcome to your new family, Sean!! Well, here I am back (or still) in Madison. I had many more pictures to share but I cut it down to these few. 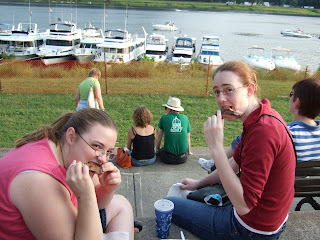 The first ones are of Miranda and then of Miranda and Shelby eating ribs at the Ribberfest, along the Ohio River. 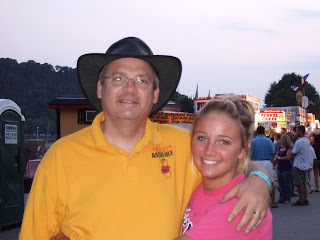 Here is DD2 with her daddy at the festival. 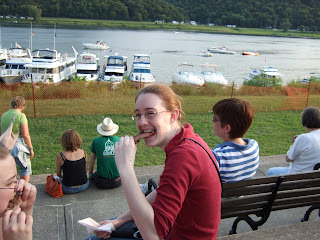 On the walk back to DD1's apt we stopped at the fountain near her place. 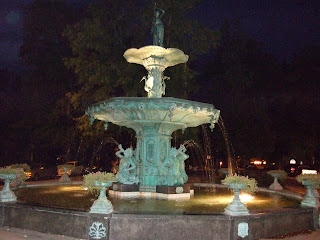 This is the fountain at night and me experimenting with my camera. 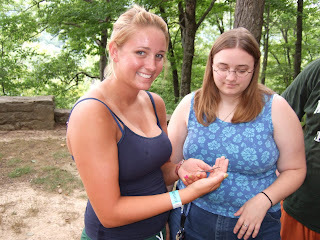 The next day we drove to Clifty State Park. 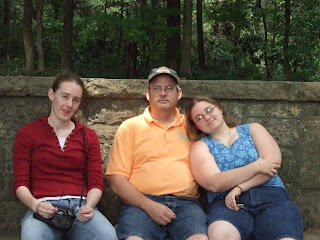 This is Miranda, Chris and DD1 at the park. At the park I found a walking stick. Here is DD2 holding while DD1 supervises. 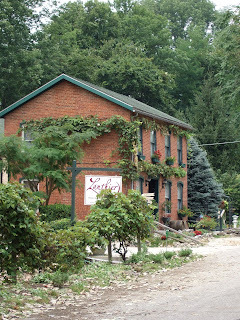 The next stop was the Lanthier Winery. I wanted to see what the local wine was like but we didn't have a lot of time as we were going to tour the Lanier mansion. So I raced in and tasted a few wines and bought some as gifts that we picked up after the mansion tour. This is one of the quilts inside the mansion. When we walked up to the mansion I thought it was the front of the building, but it was the back. The front faced the river with the gardens spread out in front of the house. 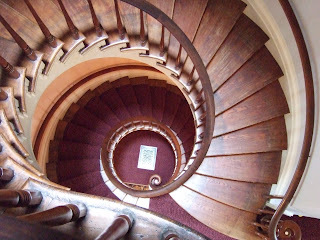 This is the stair case in the center of the house(up 3 stories). It was breathtaking! 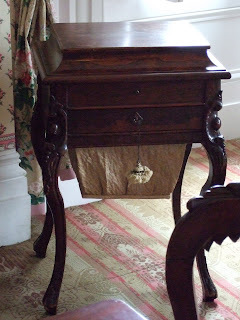 I thought this sewing cabinet was neat. The cloth that hangs down was what held the scraps of fabrics. It was so hot and humid that they had to store the fabric where air could get to it so it didn't mold! 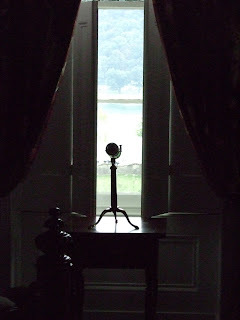 One of my favorite shots was of the spy glass they used to look out at the river to see who was coming via the river. 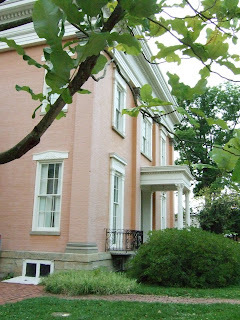 I took this to show you all what the mansion looked like "back in the day". Even in black and whit it is spectacular. 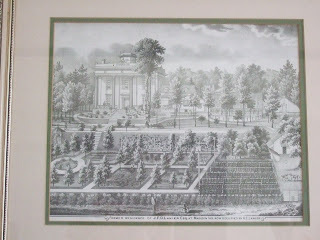 They told us the gardens are much smaller now as they don't have the money Lanier did to maintian them. 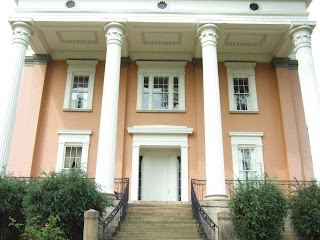 Facing the front of the mansion. 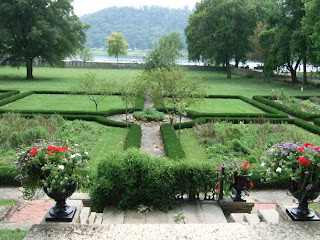 These are the gardens as they are now. Sorry so short. DD2 is leaving for IN and wanted to go out to dinner. She has a long drive back and I wanted to post while I had a chance to be on the computer. Seems like I have to compete with WOW these days and I usually lose that battle! Enjoy my little snipet of Madison!! GO STATE!! What a weekend for Spartan fans!! The Spartans won their home opener in football and the Wolverines of Michigan LOST to APPALACHIAN STATE!! Who?? Yep, that's right...how sweet is that? David brought down Goliath. I will write more later. Stay well.